Some parts of the garden are starting to wind down now, but the wilder side is still full of life and beauty. The cooler nights and recent rains have perked things up a bit, the scattered wildflowers are in full bloom, the bean plants are still producing, and the fall garden veggies are just coming into their own. But twining everywhere along the fences and any place I haven’t weeded in the past few weeks are the tubular flowers of Morning Glory. Morning Glories belong to the family, Convolvulaceae. 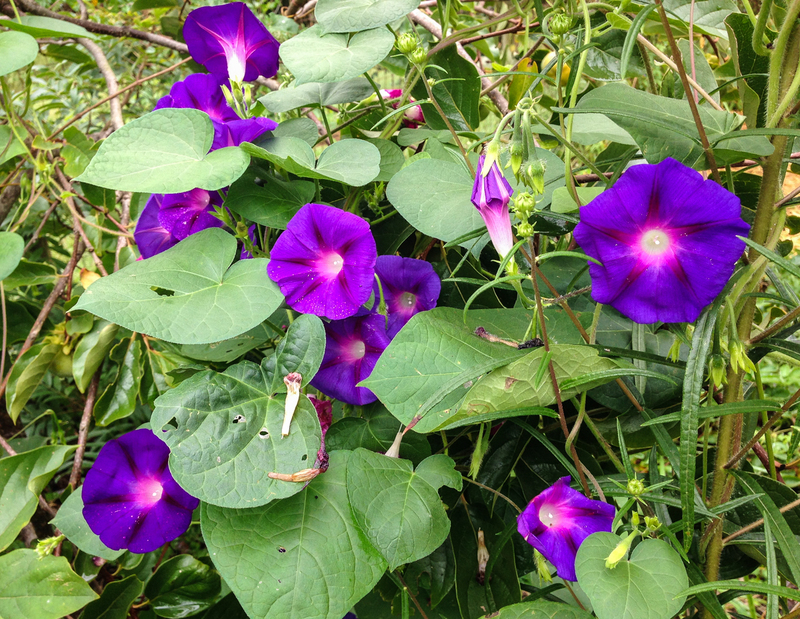 The largest in my garden are the deep purple flowers of the Common Morning Glory, Ipomoea purpurea. This genus also contains one of my favorite food plants, Ipomoea batatas, the Sweet Potato. That important North Carolina crop forms roots as it trails along the ground. The edible “potatoes” are food storage structures on the roots. Sweet Potatoes are not related to our other types of edible potatoes. 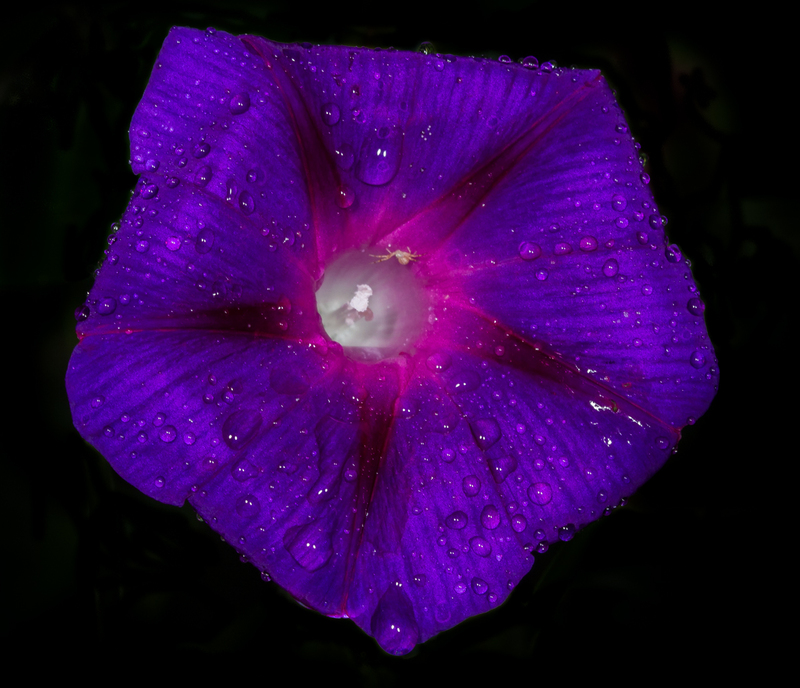 Interestingly, the seeds of certain species of Morning Glory are considered toxic, but have been used by some native peoples as ceremonial hallucinogens and for medical purposes. 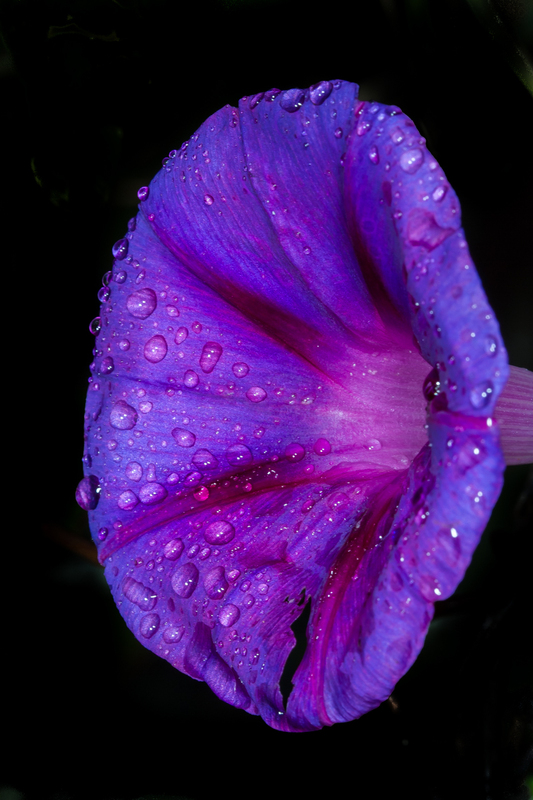 Common Morning Glory is a strikingly beautiful species believed to be native to Central and South America. 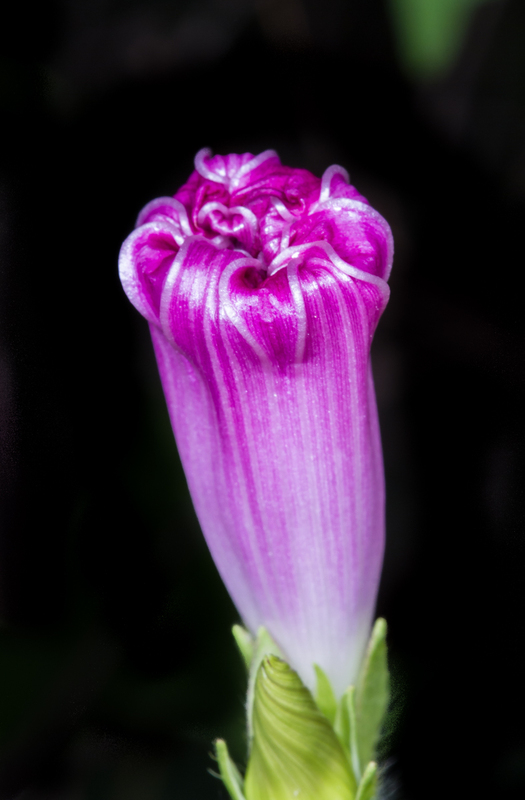 It has naturalized throughout most of the temperate portions of the world. Considered a noxious weed by many, it is also planted as an ornamental and has many cultivars. I allow mine to grow and bloom, but usually do a heavy weeding in the Fall. Seeds are still scattered over the garden and require frequent weeding, but the beauty of the flowers and their attractiveness to bees, butterflies, and hummingbirds must help soften my outlook a bit. As the name implies, Morning Glory flowers open for a few hours in the morning and then start to close later in the day. Most flowers open for only one day. 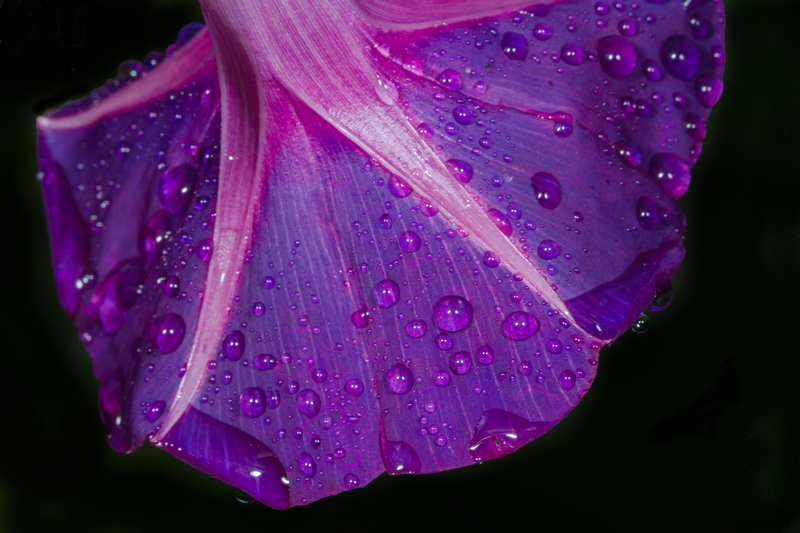 These past couple of days, the flowers have been coated with rain drops, adding to their beauty. The flowers are simple, yet elegant, even when viewed from the back side. 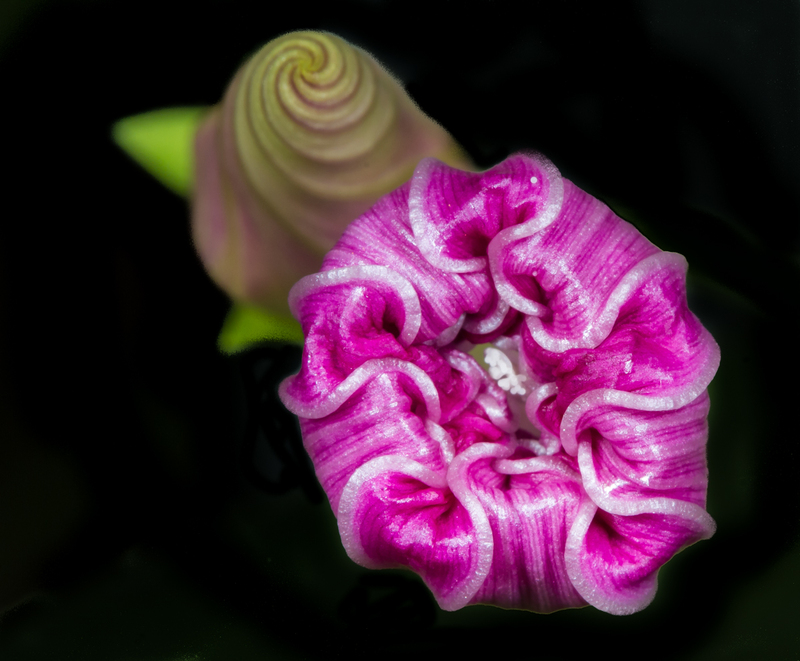 The creases and bold lines are remnants of the curved folds in the flower in its bud stage. 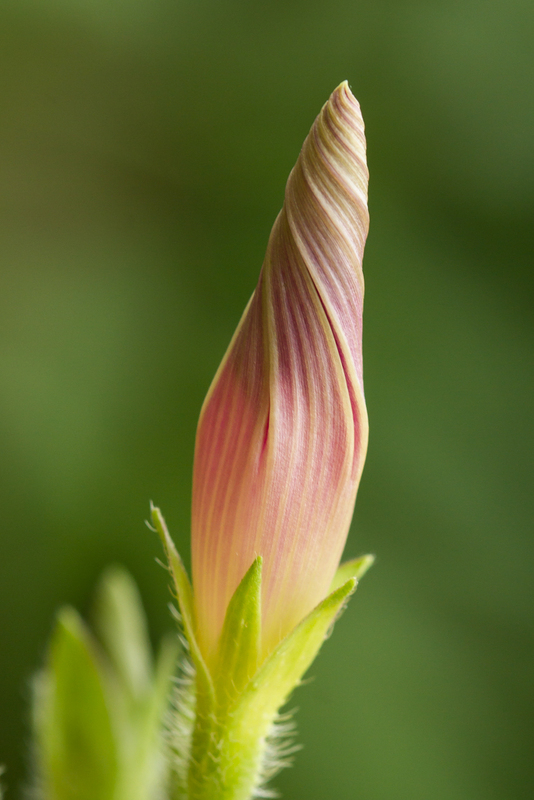 The flower buds are beautiful structures, reminding me of some sort of cherry-flavored soft serve ice cream in a green cone. I went out a little while ago and the flowers I had looked at earlier today were all closed. I am guessing that these will fall off before tomorrow morning, but maybe some will live to open another day…we will see. When I was out checking on the status of the blooms, a hummingbird was busy nectaring at the few flowers that remained open. Even when closed, the patterns are intriguing if you take the time to give them a closer look. 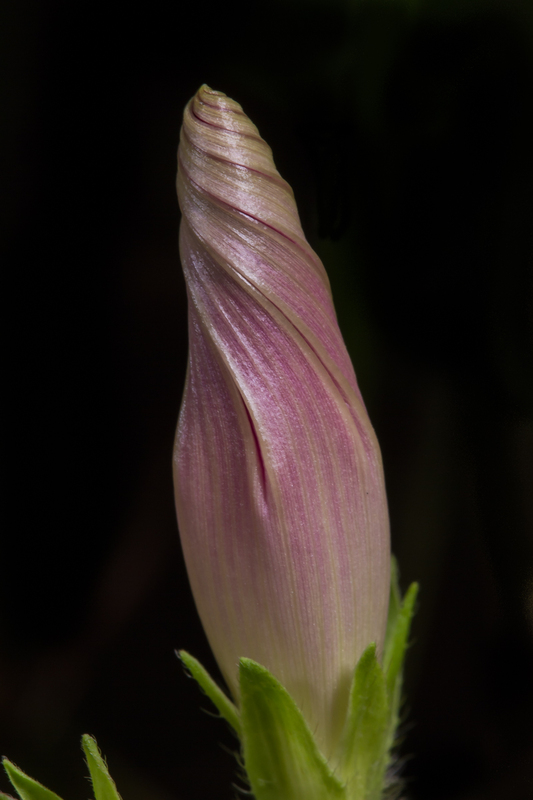 This entry was posted in Natural History, Nature Photography and tagged morning glory by roadsendnaturalist. Bookmark the permalink. I did take time this morning to give a closer look. I have considered, up until yesterday, these plants to be a nuisance and remnants of the former owners of the house. I’ve yanked more than a few out before they choke out the plants I have put in! This morning I went out to study them and found various stages of life- birth, growth and death- all in my backyard! It is fascinating to see.